This morning I’ve been tweeting extracts from this report, the DfE’s own analysis of the 2010 school workforce census. Whilst some might consider this excellent bed-time reading, it does contain some interesting evidence about key issues within the educational debate today, e.g. the academies programme and the differences between different routes of initial teacher education. 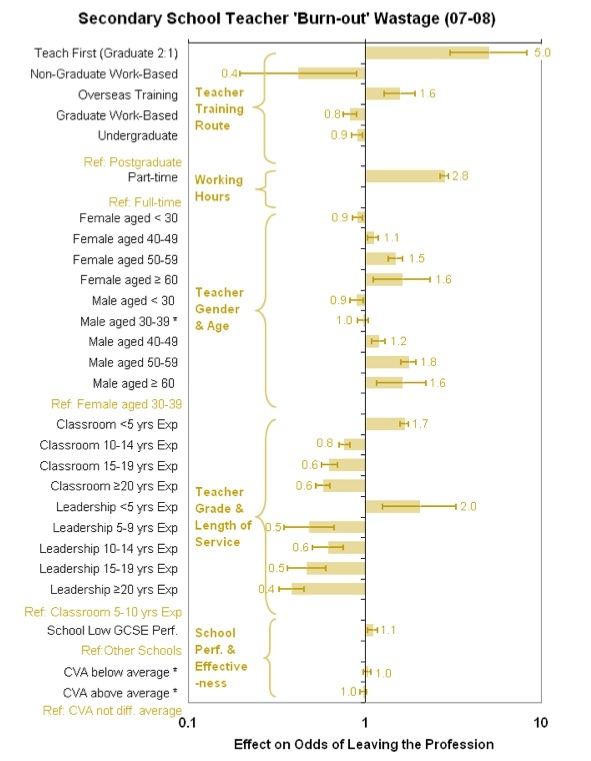 On academies, it was interesting to note that the average teacher in an academy earns less than their counterpart in a LA maintained school; but that academies pay the highest average leadership salaries across the age groups; teachers in maintained secondary schools are also more likely to have higher degrees that their colleagues in academy schools (I’m not sure that the two are linked though!). Although the figures for teachers leaving teaching after two years are not quoted in this year, the above quote is enlightening. The best that the DfE can say is that they ‘hope’ that 50% of teachers who have trained with Teach First remain in teaching after 2 years. As an aside, hats off to our colleagues running graduate work-based training programmes, you are more likely to still be teaching after 5 years, by a small margin (0.8), compared to a traditional PGCE route. Individual academics working in universities are afraid to speak out under contractual obligations that stifle freedom of expression and will, eventually, lead to whistle-blowing about shoddy practices surrounding programmes like Teach First (at great expense to those individuals who take that bold step). But perhaps the thing that annoys me most, is that Teach First have the cheek to make a virtue out of such an obvious failing. Hey folks, enjoy a short career in teaching (after all, the teaching profession will be eternally grateful for your contribution) before moving on elsewhere to a proper career in industry, business or banking. The Labour Government who facilitated the introduction of this style of teacher training, and the Coalition Government that has sustained it, should both hang their collective heads in shame. There may be a political consensus here at the moment, but I suspect history will not be such a kind judge. I’d like to hear your thoughts on this and if you feel strongly like me, please write to your MP about this shocking waste of money and the detrimental effect it is having on the wider ITE sector. And if you work on a Teach First programme and are too frightened to speak out about it publicly, please feel free to contact me in confidence about your experiences. This post is re-posted from Jonathan Savage’s blog – click here to read more. This is brilliant – Thanks Jonathan. Further evidence for the lack of any ‘evidence’ underlying Gove’s reform. Interesting stuff. Is this article not missing an important part of Teach First’s work in creating a social movement though? Lots of Teach First graduates set up social enterprises for education themselves, or if they do move into business they often provide work experience or mentoring opportunities to kids that wouldn’t otherwise have them. Having thousands of people actively contributing social mobility across sectors doesn’t seem like such a bad thing. Something else to think about; this article doesn’t look into the impact that those teachers are having while they are in education. There isn’t any evidence, as far as I’m aware, that being a career teacher for 25 years necessarily makes you a more effective teacher? And the article misses that all of those who move out of teaching have PGCE qualification that allows them to re-enter education at any time in the future. Some of my most interesting teachers were those that had other careers as well. While you make an important point about retention that should be discussed, it seems a little like you’re missing some of the wider contributing factors to the discussion. The idea that the education sector will be full of young, talented and committed individuals is great but the idea that after 2 years they will be off seeking to change the world, using particular tools and approaches is worrying. I’m concerned that Teach First might be creating a cadre of high-achievers that will see public education as something in the way of them changing the world. Some no doubt will do some good stuff. Others will complain of the forces of resistance that seek to encourage dependency or protect vested interests, such as unions or teachers who’ve been working 25 years. And, in the background, education will be privatised and run by big chains of providers. Although many teach first teachers do not continue as teachers past their first two years, many do remain in education or working with teach first in some way, such as graduate recruitors, becoming advisors or settting up their own initatives. Look up Jamie’s farm, RISE or The Girls Network’ to name a few. Even if the majority did go on to other fields, they have still seen first hand the education inequality that exists. I can’t imagine anyone leaves forgetting what they have seen and no longer being interested or involved in education in some manner. Other alumni have gone into office and administration. There’s John White, current New Orleans superintendent; Michelle Rhee, whose brash “accountability” measures as D.C. superintendent led to the mayor’s ouster and likely led to widespread cheating; Nate Snow, now executive director of TFA in Connecticut, who helped engineer the illegal state takeover of the Bridgeport school board; Kevin Huffman, who as Tennessee’s state education commissioner designed a much-loathed policy that slashes teacher pay; etc. I appreciate your concerns with the Teach First programme, but I feel some of your comments are a little unfair. You suggest that the teachers who do leave teaching after the first two years damage the stability of their school’s workforce – however, many Teach First schools already have a high staff turnover, and the TF teachers often hold a longer tenure than other staff members. It seems unfair to criticise them when in fact this high staff turnover could reflect part of a deeper problem with underprivileged schools. Moreover, I want to remind you of what Teach First’s ultimate aims are – not to privatise the public sector, but to influence young people who may end up being the policy-makers and business leaders of the future to work towards better education in the UK. TF actively expresses that as part of its aims; it is not just trying to train teachers effectively, but to inform the policy makers of tomorrow to try and create long term social change for low-income communities and schools in the UK. Although not all the participants will remain as teachers for the whole of their careers, it does not mean that Teach First will not have a positive effect on education in the UK in either the short or long term. Had an interview for Teach First to go in and support trainee teachers in schools. The whole thing was a farce – they only want people who deliver powerpoints in their specific way and toe the company line, not someone who can actually make a difference to the practice of their trainees. At my interview were several candidates who had started with Teach First as teachers, done 2 years in the classroom and were now looking to advise trainees about how to teach! How???? Suffice to say i pulled out of the process. The tasks at the assessment centre were ludicrous and anyone with an opinion (backed up by their own results in the classroom) was frowned upon. It’s either deliver it their way or not at all and believe me, their way is totally wrong.